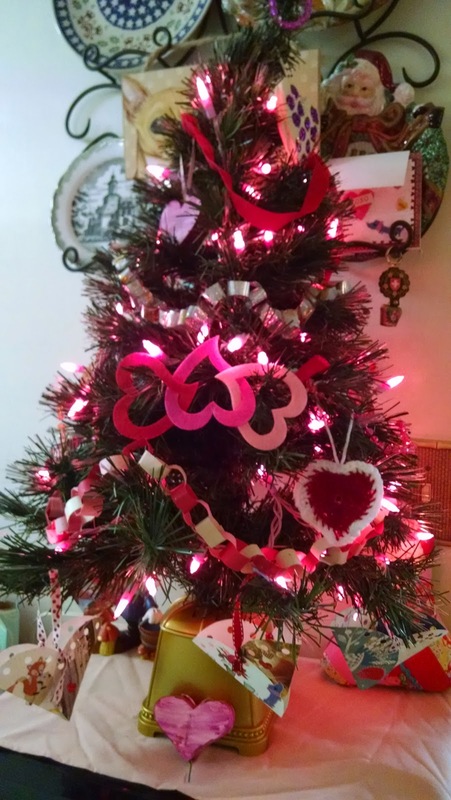 Taking down the Christmas tree, and put up the little 2 foot Valentine tree today. Its very cute. 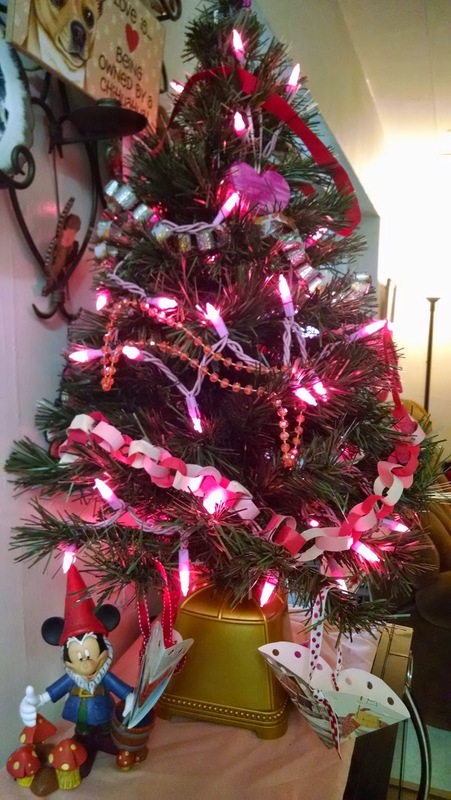 I found the pink lights at Big Lots yesterday, and that sort of cinched the deal. 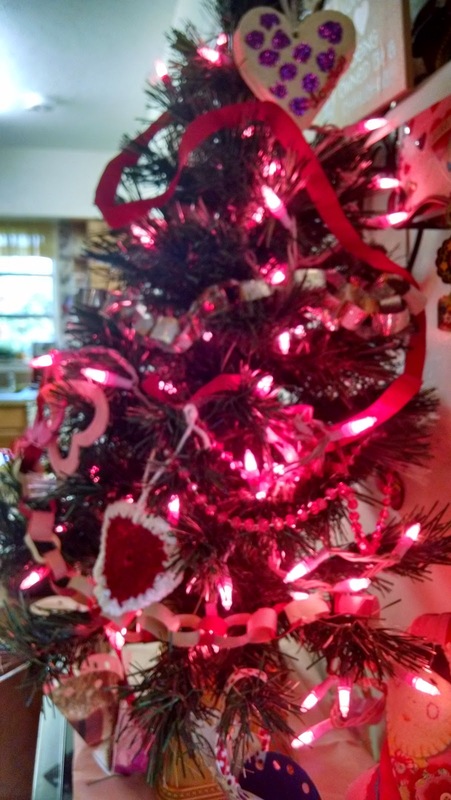 Almost all of the ornaments and chains (garlands) were made previous years by the grands. I took photos from all three sides. I know, I'm just a silly Chika!!!! Now I am slowly working on finishing the other tree takedown. 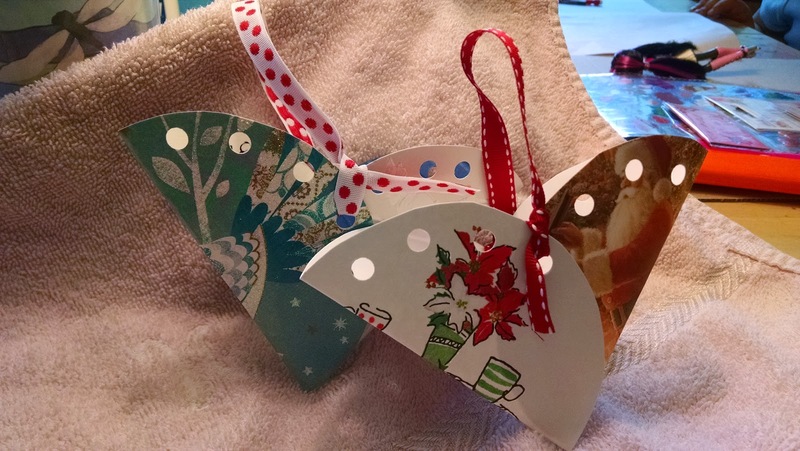 Here are some Swedish Heart baskets that Emmie and I made from Christmas cards! My latest obsession is anything Swedish. Excited to find out there will be a season 2 of Welcome To Sweden. If you missed the first season, you can watch all of the shows on the NBC APP. The commercials are aggravating, but I just get up and do something while they play. Its worth it to see the show. I thought I had posted this a few days ago! 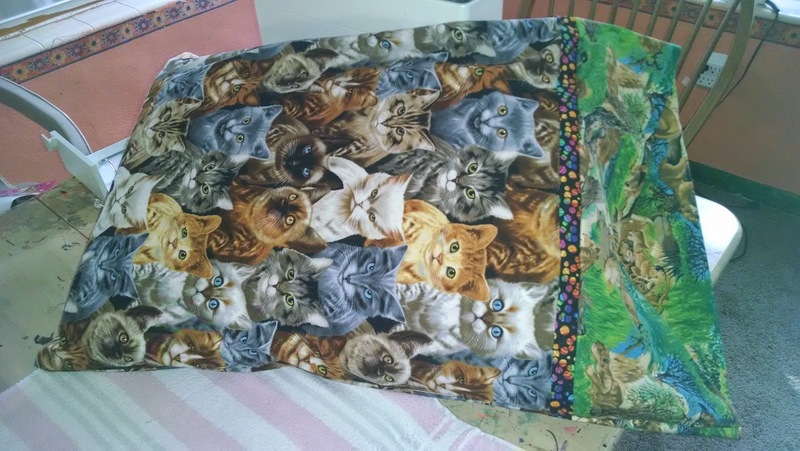 Well, I made these 2 pillowcases for my friend for our monthly swap. She doesn't come to my blog, so its safe to show them. They should arrive to her house tomorrow. 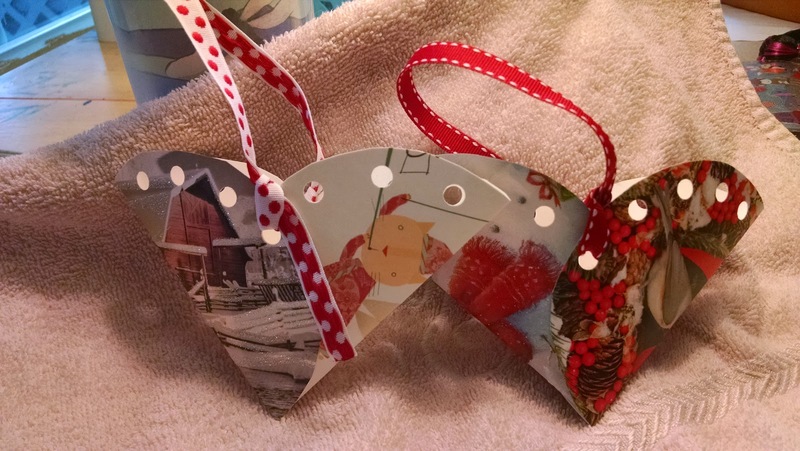 This was for our END OF DECEMBER swap. I read that Irish folk traditionally always made themselves new pillowcases at the start of the new year, to have somewhere to keep all of the money that would be coming to them. They would also eat green cabbage leaves which indicated all of the money they would prosper with in the coming year! So, since I am half Irish, I felt I could use this idea for her New Year surprise. 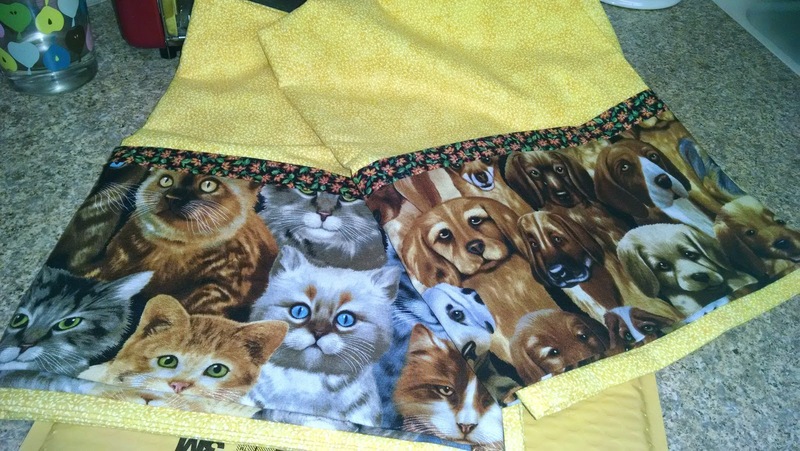 She loves cats and dogs, so I used matching fabrics, but one is cats, and one dogs, for each case. These are folded in quarters, so they are really longer and wider, and fit standard sized pillows. I will leave the cabbage cooking to her! Lol. A new case for Ems! Now I feel Donovan needs the matching dog pillow from the left over of that. I just need to find him some cool fabric to use for the cuff and accent strip. Maybe tomorrow morning!